I am so loving these Sweet Pea stitched felt flowers. I certainly wouldn't want to make my own! That stitching on them is so darn cute but I could not see myself sitting at my sewing machine sewing those! But as long as someone else took all that time to sew them I feel that I MUST use them! As you can tell I'm using the same decorative papers as I did in my card yesterday. I guess that means I didn't put the paper away when I was done! I don't like to put stuff away. I have better things to do than clean up after myself! LOL Doesn't it save time to just put it all away when there is no room left to work? I mean why put it away when you are finished with it? Are you really finished with it? See I even save time and steps by not having put it away, it's at arms reach for the next time I need it! There is a means to my madness! Ok, onto this card. This was a very simple card to make. The original was done by Julie at "Kewl" Stamps-n-more. She's got a few more cards on her blog I want to CASE if and when I get time. But for now I just CASED her felt flowers one. I did mine in different colors but it's still her layout. I also didn't have the stamp she used for the stems so I just drew mine in with an Old Olive marker. See, I can actually make due without! Hers was an Easter card and I made mine into a Birthday card. 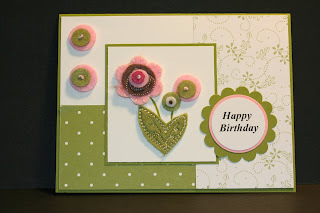 Isn't it just a sweet card? And OH SO easy! Thank you for using my card as an inspiration:) I am honoured!